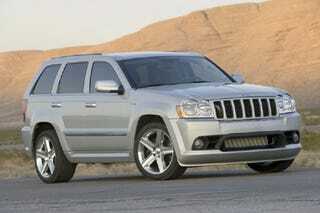 The Grand Cherokee SRT8 is already somewhat of a sleeper. Certainly, those in the know recognize its prodigious performance. But what happens when one sends one's Jeep off to Hennessey for a 27k tune-up? Epic soccer-mom-look hoonage available at a stab of the loud pedal to the tune of 620hp and 650 turbocharged torques. Car and Driver recently took one out for a spin, and the boys from Ann Arbor point out that it's quicker than practically anything one can buy for the price, hammering not only its ber-ute bretheren, but such warp-velocity steeds as the Lamborghini Gallardo; it's only off the much-lighter Z06's quarter-mile time by half a second. What's more, optioned judiciously, the beastie comes in under 70 large.